26.2 Quest: Snow Running With The Kids! 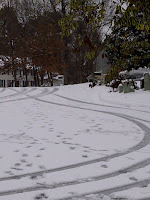 We got hit with nearly seven inches of snow last night followed by freezing rain this morning and into this afternoon. This NEVER happens to this extent here in Atlanta so everything is closed and the roads are ice and snow everywhere. I can't think of anything more fun to do than to take advantage of it and go for a run...... with my daughters! It rained (freezing rain) much of our run, but wasn't too bad because it was mostly frozen so it didn't get us wet. The temperature was 27 with a feels like of 16 degrees. The top part of the snow was crunchy from the freezing rain for the past few hours. It was still easier to run in the crunchy topped snow than it was to run on the ice where the cars had been since it was really slippery (duh!) packed down ice. The exaggerative steps to get through the snow made it a more exhausting run than even if we had been going a minute or more per mile faster. A snow storm like this is very rare in Atlanta so they don't have the equipment or salt to put on the roads to clear them off so all the roads look like this picture on the right of our cul-de-sac. Some of the more traveled roads have a few more tracks in them, but all of the tracks are pure ice with no pavement showing through. Since the temperatures won't be getting up over freezing we will probably be snowed in again tomorrow. My oldest daughter, Ashlee, is still trying to build back her mileage for track and because she has had so many issues with her shins she held it back to just one mile. Payton and I continued on to run 4.2 miles and ventured out a bit further. We run just above a 10 minute pace which was about as fast as we could maintain to keep our stepping solid. We were told multiple times while we were running that we were crazy and some people just called us idiots. While we were out running there were a lot of other people out walking, cleaning driveways or cars, but mostly just playing. We don't get that much snow here and when we do everybody gets out there and tries to enjoy it. Today since it was so cold and the snow is sticking around there are even more people out there trying to enjoy it. At one point in our neighborhood we have a really steep hill where I do all my hill repeats. Today there was a block party going on with probably 30+ people out there taking turns riding rubber-maid container tops down the hill in the middle of the frozen road. As we were headed back home we were passed by the four wheeler pulling some kids on another rubber-maid lid. I am sure you wouldn't see this in even the most back woods area up north, but it is the south and we don't see too much of this white stuff around here. 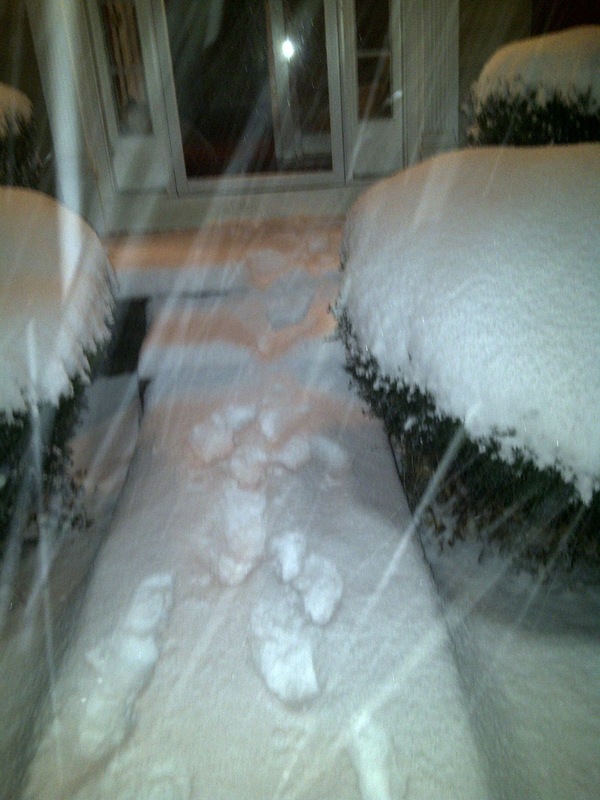 I know some of you wouldn't run at all if you didn't run in the snow. Are you a snow runner? Do you head indoors to the treadmill when the roads get snowy, take the day off, or do you head out the door and enjoy the strange looks? If you haven't stopped by and entered to win the Yurbuds yet make sure you stop by soon. You can find out more and enter to win here. Do you run with your kids, spouse, or other family member? If so why not join my new community Family Running on Facebook. 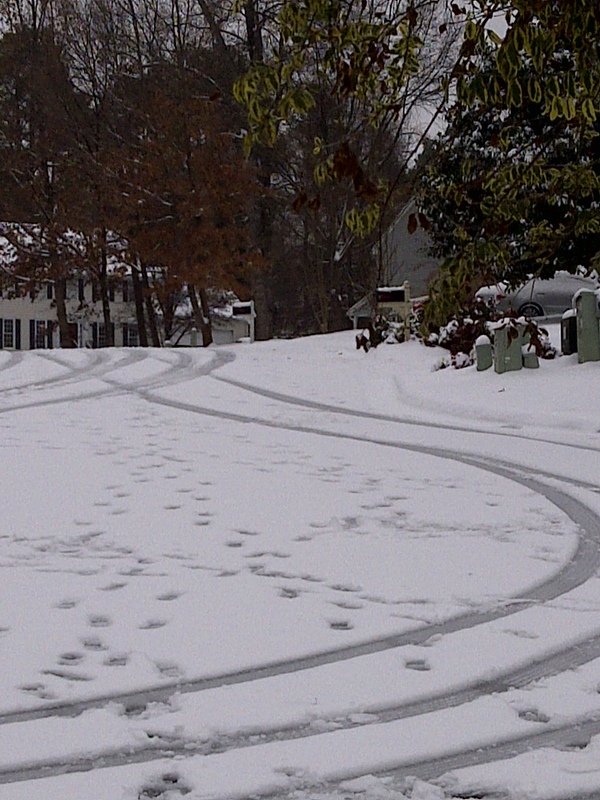 I did a snow run this noon too. Felt great! It was exactly the way I wanted to enjoy snow in Georgia. That is something I am yet to do! Very jealous. I'm very envious of everyone else getting the white stuff. I'm dreaming of hitting the slopes to get some boarding in. Even though we get quite a bit of it, I still don't LOVE running in the snow. I like running when the snow first starts to fall, but that icey stuff under my feet makes me nervous. Two days of no school and no work since we can't even get out of our driveways. The driveways here are not designed with snow in mind so here we sit. They will probably cancel school again tomorrow. I just got back inside from helping a neighbor shovel our cul-de-sac with garden shovels so we can hopefully get up and out to the main road tomorrow.